We have climbed more mountains this past couple of weeks in our travels south than we ever have before. At least that’s what it seems like. We don’t go looking for mountains. Matter of fact, we would like to avoid them if at all possible. However, if we’ve been trying to avoid them, we’ve not been doing a very good job. Remember our overnight stay at the Bakersfield Wal-Mart? Even though it was noisy it was still a perfect place to stay. For one thing it was free. Free is almost always good … not always but almost always. Even though we were kept awake for hours by our neighbor running his generator well past midnight and the local midnight motorcycle riding, we still had a great place to stay. Photo at rest area showing what could happen with flash floods. Tehachapi was certainly ahead of us. When we think of heading south we usually figure we will be crossing two out of what we consider three major mountains. The first one starts in southern Oregon as we climb the Siskiyous into California. After that we either go over the Grapevine in Los Angeles or head a little east through Bakersfield and take the mountain pass at Tehachapi. Well, we really had that figured wrong this time. We certainly outdid ourselves with mountain climbs. We didn’t do the Siskiyous. 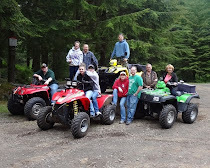 Instead we climbed up and down and around and then up and down and around some more as we headed south on Hwy 101 along the Oregon Coast into the very dense foggy California area. Once we got through the fog and the mountains of the northern California area, we had smooth sailing for many wonderful miles on the I-5. Our stop at the Bakersfield Walmart was the end to the fog and the flat gorgeous freeway system. We had mountains ahead of us. Boy … did we have mountains ahead of us and it wasn’t just Tehachapi. Thursday was designated as the day of the climbs. It started with Tehachapi and a 14 mile uphill climb. Actually, that was the easy climb. Once we got on Hiway 15 towards Las Vegas there were two more climbs. One was a 16 mile climb that we could swear went straight uphill. Well, I know it was 16 miles and it certainly seemed we were going straight up. Tehachapi was definitely an easier climb than this one! Once we reached the top, we got to go straight down for another ten miles … well kind of straight down. Finally we were able to exit into a rest stop. Our stop was just a break. We had another mountain to climb. Was it never going to end? We were beginning to wonder for sure.Finally we crossed the border from California into Nevada and the road leveled out. We were at Primm Valley with their casinos and outlet mall. We had arrived. Or, was it we had finally left California? Well, all we cared about was pulling into a place to stay. We were done for the day. Buffalo Bill’s had such a place. We moved in along with a few more trucks and five RVs. We were here for the rest of the afternoon and even the night. It seems we have been gone from our summer resting place for weeks but actually that’s not the case. It just seems that way. With new casinos to check out and an outlet mall to walk through, we had our afternoon planned. Well, none of the casinos offered us free $$$ to play … so, we didn’t. The outlet mall didn’t tempt us with any sales either. However, it was a great place to walk and the air conditioning was not pulling our batteries down. I did say air conditioning because it was quite warm. However, the heat isn’t supposed to last. In a few days these temperatures will drop and once again Mr. Heater will be used to warm us up. To begin with we weren’t quite sure where we were going to head from Primm Valley. We discovered the Thousand Trails park in Las Vegas was undergoing a major renovation. Half their sites were being upgraded. Thus, there was no availability. 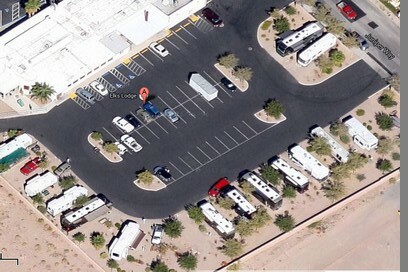 However, there are lots of places to stay including the Boulder City Elks and even Lake Mead had RV spaces.. It didn't take us long to get settled in. We were in our new site well before noon. Boulder City has a quaint historical downtown area with lots of antique stores, unique shops and cute diners. For lunch we decided to try the Southwestern Diner which offered outdoor seating. We’ve been here and done this before. The reason we decided to head this direction this time is because cousin Shelley is now living in Las Vegas. It's always nice to have others to do things with. We also hope to spend a bit of time exploring Lake Mead. Our southward journey is on hold for now. Eventually we will continue our migration but not for a while. Some people come into your life as blessings. Others come as lessons. Now you are far enough south to have lots and lots of sunshine. That is a good thing. I much prefer non-mountaineous routes myself but there just isn't anyway to climb out of this valley and on up to Montana without dealing with mountains. My southward journey is also on hold for a little while. Plenty warm enough where I am. And besides you're in no rush right. With all those mountains you've been climbing, did you need to hire some Sherpas to guide you? You two make me so nervous. Get out of those mountains once and for all. We spent over a month at the Boulder Elks. We made so many friends. Paul stayed there one year when I flew home for a visit. He loved all the bike trails. We used to spend a lot of time in Prime when we lived in California. At one time, Whiskey Pete's was the only casino there. I never considered those hills between Barstow and Prime mountains though!! I think it makes a difference when you know what to expect too. By the time you get to Barstow you've already done a bit of climbing too. The first climb leaving Barstow towards Primm is 16 miles long. Our Mountain Directory lists it's name as "Mountain Pass'. At a little over 4700' It's several hundred feet higher than the passes at the Siskiyous, Grapevine or even Tehachapi. Even though it's not as high as mountains you'd see in other states, we felt like we'd done nothing but climb that day. And, that's actually all we did. Other than being constant the roads were good and it was fairly easy, It was just continually up and then up some more.. So whether it was mountains or hills, we were glad to get all those uphills behind us for a while. Well, we went in totally different directions and ended up in pretty much the same place. Hahaha. Dave's brother keeps asking me when I'm going to pass through Idaho and see them. I keep telling him he's surrounded by mountains which is not good for spring or fall traveling. I love summer in Oregon and winter in Arizona but I would not love traveling between the two twice a year. Not that I love traveling between Arizona and Minnesota either. It's just what we do to get to where we want to be. Sounds like a route that we would avoid our gas v-10 does really not like the mountains, but would sure be some interesting scenery. If I head toward Vegas I'll take the route that brings me in on 95. That way I can avoid those long climbs. It won't be long before we're taking some of that same route south. This year we'll be going over the Siskiyou's and Tehachapi - as long as there's no snow I don't mind the hills. Looks like you've found a comfy spot to rest up for a bit. I think that's pretty much our favorite route so far too.